Archon Tetris is a browser based Tetris game that offers some fun twists on the block breaking classic that really shake up the gameplay. 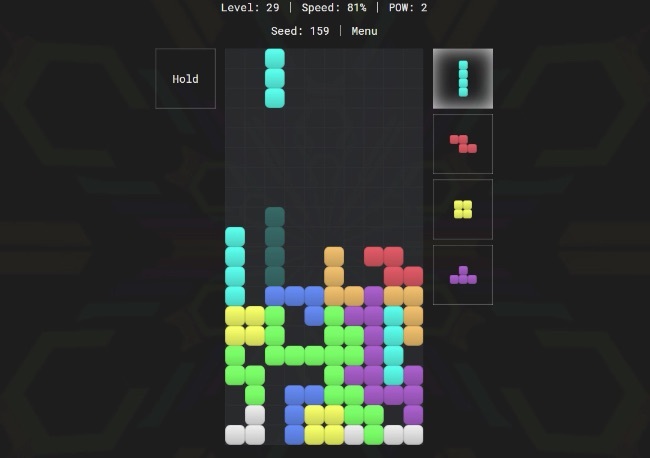 The core gameplay of Archon Tetris is just like the original – you place blocks to form lines and earn points as they drop from the top of the screen. As you progress the speed that the blocks drop increases until you’re eventually overwhelemd and the blocks reach the top of the screen. However, there are some significant changes in Archon Tetris that can make it a very different expereince. For starters, when you complete a line all the blocks that were attached to that line are separated into individual blocks that can drop down into spaces below. You can also earn and use POWs which have a similar effect, but for all the blocks on the screen. Occailsionally the game will also pause and you’ll be able to select the next four Tetris shapes that you’ll get. Not all the changes make Archon Tetris easier than the original though. Now and again extra large pieces will drop which can be particularly tricky to find a place for. Also some “Friends” will pop up now and again giving temporary boosts to the speed of the game (or sometimes the score). It’s a fast and fun twist on the classic game of Tetris with a great visual style and responsive controls. The fact that loose blocks can drop can make you feel a lot better at Tetris than you really are, but once the speed ramps up you’ll still need some serious skill to survive!